FINAL SUMMIT PUSH ON EVEREST! We would like to take the opportunity to thank the entire Nation for appreciating and encouraging our “First Pakistani Gender Equality Mt.Everest Expedition 2013” success. Since our mission is not just to reach the highest mountain heights but the mission of our expeditions are deeper, for Gender Equality and empower women through adventure sports and encourage and promote outdoor sports, give awareness and work on tourism. Before going on every expedition, we prepare detailed plans A, B and C, according to that we take the decision. Our Mt.Everest Expedition on Eve of the 60th anniversary of Mt.Everest since its first ascent back in 1953, we had the great honor to represent our fatherland Pakistan on this international mega event, I privately organised this expedition, with the kind help of our New Zealand friends, Jennifer Kent, Joy Deerness and Arthur Smith - their financial support made it possible for us to represent Pakistan and its green flag with the first Pakistan girl attempting the tallest mountain of the world. I did this effort without any support from Pakistan, since I love my country and have the passion to do something for my country within my capacity and my friends help made it possible that the first Pakistani woman, Samina Baig could hoist the Pakistani green flag on top of the world. I take the opportunity and request every organization and media house to be patient for our detailed informations and please DON’T MAKE ANY STATEMENT WITHOUT OUR PERMISSION prior to our return. Please you must not give any wrong information. We will explain every thing in detail in our upcoming press conference when we arrive Pakistan soon. Every statement and information is our copyright, so please wait until we are back in Pakistan. Thank you for your patience. Thank you again for your appreciation. Pakistan ZindaBad!!! Mirza. Thank God Almighty, today on the 21st of may, after 5h of strenous climb down through the difficult Khumbu Ice Fall the complete Team has returned to Base Camp. After some rest Samina and Mirza will give you more details here soon! Today 20th of May, the team rests in Camp II after the non-stop climb and descent yesterday. We are very thankful for all your prayers, support and good messages that we received during all the weeks on the expedition as well as during and after the summit climb. Even here in Camp II we receive the positive reactions. It has been a long journey for Samina and me over the years and we want to thank all of you, who supported us during all this time and made this possible! Shukria & Thank You! Our journey is not finished yet, Inshallah the return to Base Camp is planned for tomorrow. Today at 7:40am local time Samina Baig has successfully reached the summit of Mt Everest together with the Indian twin girls Tashi and Nungshi! 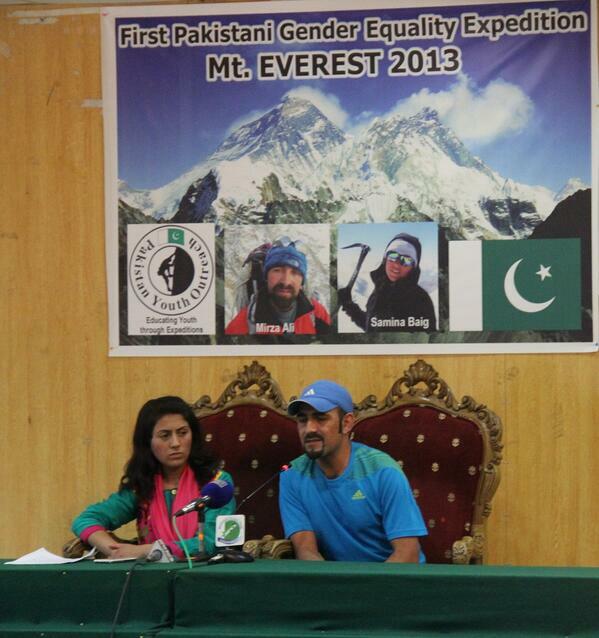 At the age of just 22 years, Samina is the first over all Pakistani woman to scale the highest peak of the world! Congrats Samina! Congrats to the complete Team! Mashallah, all your prayers have been heard and fulfilled, after hoisting Pakistans Green Flag on the summit of Everest, the highest peak on this planet, Samina successfully returned to Camp II. Reaching the summit is only half the way and due to exhaustion and the severe conditions in this altitude make the descent very dangerous. But now they are back in safety after a long and strenous 24h climb in this extreme altitude. An incredible performance by Samina at an age of just 22 years, she is the strongest daughter of Pakistan, the pride of the whole nation. If such a young girl can summit the highest peaks in the world, you can do everything - a symbol for all women and the complete nation. Pakistan zindabad! Day 49: 18.05.2013 Successful ascent to Camp IV at 7.900m today! After a hard and strenous climb of 8h the team has reached Camp IV at 7.900m today! Samina and Mirza as well as their Indian friends Tashi and Nungshi feel good and ready to start the final summit push. The weather conditions are difficult and very windy, if the forcasted betterment sets in, the team will start the final summit push tonight, Inshallah! My dear friends, followers and supporter, keep your fingers crossed and pray for a good weather window and good luck for a successful summit push of the team. 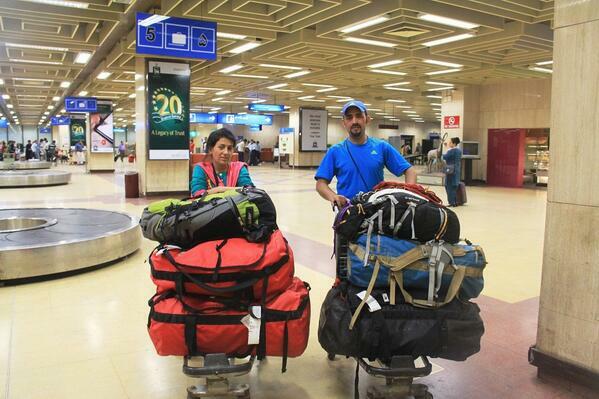 Samina is the first Pakistani female climber to reach such heights and we all pray for her! Pakistan zindabad! Our Satphone battery goes low right now, we hope to save the best news for the summit, nevertheless dont worry if the news fall out for some time, no panic it would just be our battery that causes some delay! 17.05.2013 The Team has reached Camp III at 7.100m today! Samina and Mirza climbed to Camp III in 5h without use of supplementary oxygen. Together with their Indian team mates, the two Indian twin girls Nugshi and Tashi, the team left Camp II at 9:20am and reached Camp III at 2:10am. Tomorrow the team will head for Camp IV and depending on the weather conditions start their final summit push on 19th or 20th of may. Best of Luck to the complete team!!! Day 46: 15.05.2013 The team has reached Camp II today! 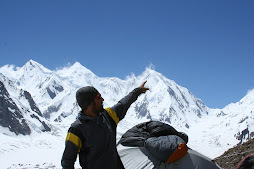 Mirza said "We left base camp at 4:30am today and reached Camp 1 at 9:00 am. After one hour rest we continued to Camp II which we arrived at 12:00." Tommorow is a rest day - everything is going according to the plan! On the 17.05 the team will climb up to Camp III, followed by reaching Camp IV on 18.05. Depending on the weather conditions the final summit push could be on 19th or 20th of May. Keep your fingers crossed and check our news feed here for latest updates of the final summit assault! Today is an exciting day, since it is the last day of election campaign before the elections in Pakistan. We hope for a huge change!!! We hope that the youth and all the people of Pakistan will understand the need of new change in the country ! So we hope everybody will vote for the right person for the right change!! Go GREEN!!! Pakistan zindabad! Today we got the good news that after long waiting in base camp, finally the weather forcast arrived. And the predictions are good: the weather window for the summit push is starting 14th May, we will leave for Camp II on 15th of May, 16th rest at Camp II and 17th Camp III and 18th Camp IV and 19th Inshallah will go for summit push! We request all our readers and visitors please pray for us for the great success that Samina will become the first Pakistani women to reach the szummit of Everest. And I hope to be the first young Pakistani without bottle oxygen to unfold Pakistan`s Green flag on top of the world together with our Indian friends! Wish us luck!!! Will update shortly as we leave for Camp II. Thank you for sharing and for your support! Today exactly we have 30days, since we arrived here at Mt.Everest Base camp. It is a permanent habitant now for the said period, interestingly we used to base camp now, food and home (tent home) is now like part of our life unless the expedition is over. Lunch was delicious today, lots of sausages and nice rice with Dal. Then I got a message from Mehboob bhai. I called him and we talked. I was happy to hear all going well at home, specially our International ski group is back from Shimshal Pass. Gul bhai who was guiding them, Armin left his stuff there in Shimshal at our home for the next international ski tour. Hopefully next year around Shimshal, Shimshal pass over Braldu to Snow Lake. Mehboob bhai, also told me about the political situation in Pakistan. And the fall of Imran Khan from the stage, where he got seriously injured and has been hospitalized at Shaukat Khanam hospital for treatment. I really like his courage saying that he had served the nation over 17years and now is time for the people of Pakistan to take care of themselves by voting the right person. And for New Pakistan. Mehboob also said, after the injury today was his last public meeting in Islamabad and even hospitalized, Imran said, he will go on wheelchair to address public in blue Area Islamabad. We wish Imran good luck and fingers crossed for his success from Mt.Everest! In the night we watched two movies, for the first time. But after watching half of the second movie Samina and me went to the tents and time to sleep. My tent was unbalanced, since we are at base camp for a month now, the glacier has been changed greatly because of the heat it is melting every day. After breakfast I started leveling my tent place while Samina, Tashi and Nungshi went to the Doctor. Tashi has gum pain ,Samina has a blocked nose. The Sherpa Lakhpa and me leveled the tent and put it back. Then Suzanne visited us and we talked about the plans and adventures. After a long chat we went to meet Evelyn and Alex. Evelyn was interviewing Alex for her film. When they finished, we talked and Evelyn told me about her Gasherbrum II expedition and about her climbing. She also flew Helicopter and remains Helicopter pilot. Now filming, later she said, she will come later to Interview me and Samina and they left. So we had lunch. There was not much going on later and I started the new book that Suzanne lent me. In the afternoon Mr.Chang came to our Dining tent and played cards with Tashi and Nungshi, I don’t know how to play so kept busy with the book, today we also bought TV to our dining tent.But we were very depressed since one of our team Sherpa, LOBSANG SHERPA fell to his death between Camp II and Camp III. Lobsang was from Kharikhola and had climbed Everest three times before in 2007, 2010 and 2011 (read Day 38 for the details of the previous catastrophy) we were not in the mood for watching TV or anything else. Our thoughts were with our fallen friend and his family. "Hey Mirza, how r things bro! Wanted to reach out to all my friends and family in Pakistan, since i am not in pakistan and we oversees pakistani's cant vote i would like to reach out and say please do go out and vote on 11th, please do that, I wish i could vote, please do go out and vote. Please do vote for change please do vote for new Pakistan, do vote for Imran Khan, we all need change in Pakistan, I am not at all affiliated with any party, but what i saw on TV Iman felling from Stage but still said "Please go out and vote" makes me think he is an amazing leader, a guy who lays on hospital bed and can barely talk still makes an effort to tell the world we need change in Pakistan please vote for Pakistan new pakistan, really appreciate, Faizan". He urged me to vote for Imran Khan, for a new Pakistan. I since Im not in Pakistan right now, I can’t vote. But even in Pakistan, the people of the Gilgit-Baltistan province are excluded from the elections, we can’t vote for the parliamentary elections, which is shame! We are not considered or not yet fully empowered as Pakistani, we can’t vote and we don’t have any representative in the Parliament and Senate. But still we are proud Pakistanis and love Pakistan. And every one in Pakistan should love Pakistan! Engorged with books gave amazing time and loved how things turn up when people work hard. In the morning the weather was nice and pleasant. I am usually last one to reach dining table, I was given some nice breakfast, Samina, Tashi and Nungshi had already finished their breakfast and went back to the tents. It gets a little bit boring, since there is nothing much to do. Waiting now for the final summit push, and there are several rumors about a good weather window and the route to be fixed to the top. Later Suzanne came with Evelyn to meet us. Evelyn is making a movie/film about climbing Everest. She is a lovely lady and we spoke and went to the bakery to enjoy some delicious extra food. Suzanne and Evelyn, said they will come tomorrow to interview Alex, Samina and myself. After lunch we went to the tent, me and Samina talked and then Nungshi joined us. We talked a lot, the main topic was the general election and the most possible win of Imran Khan or the old parties. We had a strange feeling, what is going in Pakistan, since couldnt hear or read any news about the current political situation. We hope that this election will bring a new era in Pakistan and we will have a new change. We hope that the new generation will understand the need of the time and must vote the right leader who can move Pakistan into the right direction and get on the path of prosperity and development. After that we had tea time. In the evening while I was offering my prayers, Samina rushed to my tent and said that one of our sherpa is dead in the kitchen!!! I was shocked and ran to the kitchen, when I arrived at our dining door, our friends were already there and said LOBSANG SHERPA from our team fell to his death from South Col, while climbing down from Camp III. They said, he didnt clip in safely into the main rope. And that was the reason why he got tossed down and speeded up so much on the fall that he crushed into the sheer ice face of Lhotse and died. He was a very experienced climber, climbed Everest three times before, in 2007, 2010 and 2011. we were all very much shocked and couldnt believe what had happened. Today we lost a good friend and team mate that gave everything for this expedition. A very sad day for all of us. Not much today, most of the time resting and eating, reading and that is it! While going to bed, I told Mr. Chang from the Chinese group that I want to make a short meeting and talk. He agreed and later he called me when I was going back to my tent. Mr.Chang and Mr. Yang were in the dome tent, I was there with my laptop and video footages of previous expeditions, I showed the videos to them and they were very pleased. 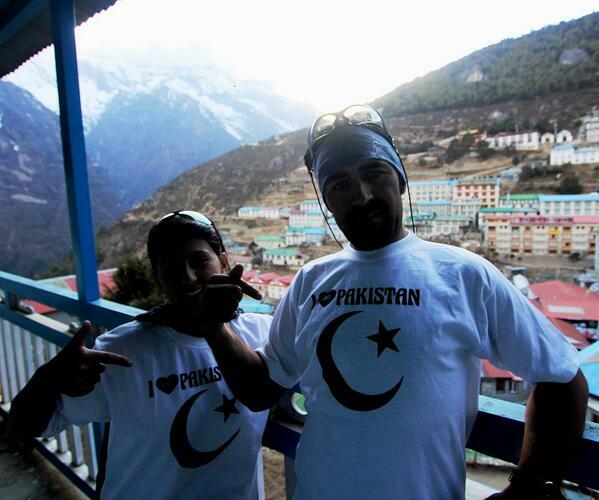 Very happy to see I did some promotional work of mountaineering in Pakistan. Actually my plan was for this year to do Mt.Everest and then Lhotse ,and in summer in Pakistan to attempt Broad Peak and K2, that was a lot of climb, but I have a big plan, a mega plan. I discussed the plan with Mr. Yang and Mr.Chang, they were very happy, Mr. Yang assured to talk to the main boss and will get back to me, though financial support seems impossible but equipment is much possible, then I decide and change in Plan that me and my climbing partner Arshad will try to attempt three 8000r in Pakistan, namely Gasherbrum I, Geshbrum II and Broad Peak, then in October a trip will be made to China, a new brand is supposed to come to Pakistan! Samina, Tashi and Nungshi used their free time for some washing and rest, they always stick together on every move. I like this connection, getting strong, and stronger each day, they hope to climb together as we have been aiming to do to the top. The weather had been perfect but since we have done with our rotation up to Camp III, we are waiting for the weather widow and route to open to the summit. After update everything was relaxed ,when walked to dining tent, the girls had left already, satiya and arjon were in dining tent, and Sanju was late today as well. After my breakfast, had some photos for Chinese friends and also small interview for change, china has sports meeting this year and one of the guy is representing the event , later Samina was also interviewed, then I went to my tent, there was a call, then I see size and a lady barbra , suzi came to visit us and Barbara was filling forms of climbers trying to climb Mt.Everest. suzi was surprise to know that Samina climbed up to CIII, she was very happy too, she enquired about the suit, I said it fits her ,little lose from lower body but using climbing boot will make it fit. Little thing from bakery and they left. After lunch I went to meet Chris and Margaret. They were in a tent watching movie.margaret didn’t want to stay inside the movie tent, and we went to dining tent. We chatted and showed them the short films I had and also fresh photographs of cIII. We talked a lot and then they gave me three books, for reading, since don’t have any for reading, I like the books and later I came back to my tent, nothing much, but some fun, I talked to my Mom tonight and also with my best friend, Samina also talked to Mom and zulfi, all was fine, we enjoyed the day,Samina ,Tashi walked around and so Nungshi, they feel relaxed after the achievement getting to CIII, all they need now energy and much food and lots of relax, we don’t[ have much news, when is the weather window, different rumors. But I expect 15th of May onward. Hoping for the good weather, or dinner we had chicken, my favorite, then music and well, I start the book “the Everest years” it was nice written book by Chris , I loved the story ,specially the story of ogre is much inspiring, I extend my great respect to those great adventurers of 60’s,70;s and 80’s, specially first ascents and new lines, I truly loved the story and the tragedies are very painful ..The honest write up was much interesting learnt much of those early expeditions, since I hardly read some of the adventure stories from the 70’s.solute Mr. Chris Bonington. It was long break since I had to update my website, however my great friend and like brother, Christof makes the update if I send sms through Satellite. Well. I was weak or lazy to walk down to Gorak shep to make the update, since here at Base Camp Internet is very expensive, 1$ per minute, so I prefer to go to Gorak shep to Pay 15 NRS per minute. In the morning I was late and just got my rucksack, had some water and then left. I was alone this time, walked normal pace. While walking down the small ridge of a morain, I saw two people walking pretty fast, I was wondering, normal trekkers who trek up to EBC don’t have such a pace. There was a lady and a man. Soon when I got closer I saw the lady waving at me and than I recognized her! She was Margaret, a friend of Chris Burke. Margaret is from Australia (Sydney), a lovely lady with lots of talk. By profession she is a high school teacher. By nature she is so nice and lovely! We shook hands and she introduced me to Peter from Irland, a great nature and smiling face too. We started our hike down to Gorak Shep. In Gorak Shep we went to different lodges. After that we said good bye and said we would meet up the next day at EBC at their camp. I used to go to one lodge with slow internet but very nice people. After my last update I forgot my Mp3 here, fortunately they hold it in their custody and returned it to me. This time I needed a long time for all my updates - it took me nearly 4 hours and cost me NRS3000. After that I had lunch and tea. In the evening when the snow started falling, I packed my bag and left for EBC. I shared lots of photos and update the site, since we had touched Camp III and no update for nearly 10days, this was long update and photos of our climb up to Camp III. But it was nice, on the way back, I met several people covered their faces from snow and wind. But the snow was opposite my back and was easy to walk, I was little cold in the lodge, so my pace was not very fast, I slowed down and walked on the pace of my MP3. I reached base camp and had some tea before resting in my cozy sleeping bag. In the evening we watched a movie of Arjun bhai,was stuck in the middle, then night time, I wanted facebook access via Ncell but it does sometimes work, mostly not, but I could see some notification and some comments. And they were nice, wanted a message but didn’t appear now for nearly two weeks. Any way time to sleep ! Internet connection is not fixed yet in our base camp, so we have delays in our udates. Hope to make it daily, if the direct connection can´t be made, it would mean that update will be made in a week time! Thank you for following us and sharing our story! Touching Camp III at 7.000m, resting three nights in Camp II (6.430m) and return to Base Camp (5.350m). Today we had to back to BC after spending three nights at CII 6430m, the girls felt great, NO health Issue, NO High altitude Issue! After breakfast at 7:40am, we left for BC and I was fast this time, really fast ;-) it took me 25 minutes to reach CI from CII and then 1 hr and 10minutes to BC. So alltogether It took me 1and 35 minutes from CII 6430m to base camp. The girls and Sanju kept up a fast pace too ,it took them nearly 2hrs and 30 minutes. Samina is feeling strong, she is amazed and feels proud to represent Pakistan and touching 7000m was a mile stone for her being first female Pakistani to reach this height on Mt.Everest. Her new Indian twin sisters are also doing great and they feel happy climbing together. Camp II 6430m Rest Day. After 7 hours of great climb from Base Camp to Camp II, I was worried that if the girls get sick or have altitude issue ,since non of them had slept at this altitude. But it was amazing to see that the girls slept excellent without any issue. Samina,Nungshi and Tashi shared a tent, while Sanju wanted to share the tent with me. The girls slept well while Sanju had issues with sleeping, he kept me awake. Finally I radioed Mingma to call Sanju Sherpa Pemba and also bring Bottle oxygen. They brought a bottle of emergency oxygen, I put Oxygen for Sanju and he then could sleep. During the day, there was not much happening, we spent the time lying in the tent, chating and the time passed by. After lunch I walked to upper Camp II, where met Chris, our Kiwi friend who plans to climb Lhotse. She has already done Mt.Everest and she is the first Kiwi to finish all of the Seven Summits. I met her last year on Manaslu. She is a lovely strong lady. We chatted for a long time and I knew there was a fight between Simone, Ueli and the Sherpas. The Sherpas threw rocks on them and also ruined their camps, I didn't know about the facts behind that happening but getting physical on the mountian is not nice!!! We reached Camp II today!!! Preparing for Camp III for tomorrow! We left base camp at 2:45 and reached Camp I at 7:00 am and had a rest before proceeding to Camp II which we reached at 11:00 am - everything goes well, according to the plan! Tomorrow we hope to touch Camp III. If everything wors out I hope to reach South Col and than return to base camp. After that we will start our final summit push. We got up in the morning ,after Breakfast, the sherpas came to look for the gear and things that we need for the summit and on the mountian. We are planning to leave tomorrow 27th April for our last rotation /acclimatization. We sorted out all our gears and also some personal food that I brought from Pakistan for high altitude. Mingma ,Samina`s Sherpa sorted out things and then we packed everything. Today weather is pleasant, we are hoping for good weather up on the mountain. We are planning to leave for CampII (CII) tomorrow at 3am. We will stay four to five days on the mountain, will touch Camp III (CIII), possibly stay over night there. I will try to touch South Col, since I am aiming to summit without bottle oxygen. Wish us all good luck and pray for good health and good weather and good climb!! On the way to base camp from Gorak Shep I met Chris our Kiwi friend whom I met on Manslu last year. We had a great chat with them and met her friend Margret. They visited us today and we chated a lot about climbing. Chris is climbing Lhotse while Margret will climb Mt.Everest. Margaret had also travelled to Pakistan and was very happy to see the first Pakistani girl to climb Mt.Everest. They were pretty happy for Samina and wished for her success. We had some delicious apple pie from the bakery and cake as well. Later we took some photos. In the evening we watched Arjan Bhai, the Nepali actor movie “Bazaar”. Was interesting to watch the movie with the person who has the main role in the film. All good. Today we also participated in a survey from an Australian University. The survey was about decision making on high mountains. It included a game where you can win cash if you play well! Though the logic didn’t suit me , it was good to conduct the survey but part of the survery was to make people greedy offering money!!!! Not nice! This could be done without offering money ! We all played, Nungshi won the high price so did Tashi, Samina and me won nearly the same price ;-) But we gave the money to one of the Sherpa, with whom we trekked all the way from Kathmandu. 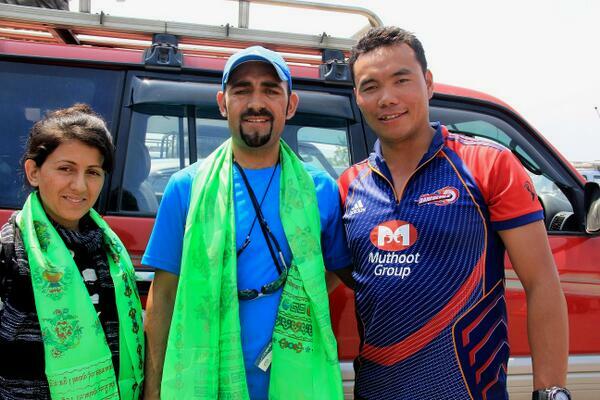 He is such a nice guy but he had some health issue and was airlifted to Kathmandu. We all hope that he gets well soon! He is nice guy! His name is Karama! The weather for the last four days was not so nice. It snowed most of the nights but in the morning it was clear. Today also met Ilina, one of my facebook friend. She is from Macedonia and she is also planning to climb Mt.Everest. Ilina is also the first Macedonian girl to attempt Mt.Everest. There are several first females from different countries who will attempt Mt.Everest. Good luck to all of them ! Today after a long break I walked down to Gorak Shep to update you about our activities and post some pictures! The trek was great. I trekked half way together with Ilina and then she went to Kala Patthar and I walked down to Gorak Shep. Before leaving for Gorak Shep, we took some pictures with the national flags of Pakistan and India, to say we are one, the youth are one and we all want peace!!! While trekking down, I met a Pakistani-American, since I wear t-shirt with the Pakistan flag he approached me and had a nice talk. He was happy about our mission and told me about his group of nine Pakistani-Americans trekking to EBC. But the rest of his group was behind and he said we will meet the rest of group when they reach EBC. Well: our upcoming plan is starting from 27th of April and our Sherpas are setting up Camp II. Us five "Samina, Nungshi, Tashi, Sanju and myself" leave for Camp I, sleep there and continue to Camp II. After that we try to touch Camp III and then return back to EBC. We don't want to climb through the Khambu Ice Fall, since it takes most of your enegry. I am planning without O2 and will go to South Col, back to Camp II and sleep there before going back to Camp III and stay there for one night and return to EBC. Wish us good luck!!! For pictures, please visit our facebook page! Finally the day came when we put on our gear and got ready to climb/walk through the most famous Khambu Ice Fall. I woke up at mid night and found myself feeling excellent, no cough, no chest burn, no blocked nose!!! I was so happy, heared girls chit chating in the next tent, I got up and pulled my backpack and put on my shirt, climbing trouser and then boots. Samina showed up and said "How are you bhai"? I replied perfect and I am ready to go!!! She was happy! Nughshi & Tashi were getting ready as well. Meanwhile Sanju passed my tent I was not ready yet but he was surprised to see me getting ready. It was 3am in the morning when we all moved to the dining tent for early breakfast. Tashi the manager was there as well, our delicious breakfast was boiled eggs and toast, rice and pudding. After finishing breakfast, we headed to our tents to carry things we were supposed to carry. We started at 4:37am, Nungshi, Tashi and Samina had their Sherpas while I am without sherpa :P I didn't even meet my sherpa but its fine with me, I can survive without Sherpa. Each one of us took nearly 3L of water along. One interesting thing was that all four Shepas of Samina, Nungshi, Tashi and Sanju are called Mingma! Seems to be a very popular name :-) But it gets confusing when someone calls Mingma. Well, we left for the climb, after 10 minutes without crampon we reached at cramonp point. However we could have put on our crmpons right after our tents, but we walked and then near the fixed rope we put on our crampons. The pace was amazingly fast, Nungshi´s Sherpa was ahead of all and was going too fast. I was sweating after just five minutes :-) At crampon point, I started leading, since he was very fast! :-) Going slow through the vicious Khambu Ice Fall was interesting in the night, all with headlamps going fine! Than the weather turned bad, I was filming and taking some pictures. Going through the ladders is interesting. We reached the height of 5883m. The snow started to turn heavy and the Base camp radio called us to turn back, at this moment I was nearly 15 minutes ahead of group! I didn't want to go back and kept on going till Camp I. We had some nice lunch and dinner as well, and all felt happy ! Today was Puja (Buddhist religious ceremony) , nearly 80 people were there and three Lama's ,reciting the prayers and celebrate the Puja. Every climber and Sherpa has to take something from their climbing gear to the Puja place, where the Lama gives special prayers. Today we had late lunch but it was tremendously delicious, like always! Our food is too good. In our Interantional group there are nearly 16 people so Tashi the manager and owner gave for six of us a seperate small dining tent,where we can have indian /Pakistani food, so good food :) It is a very cozy dining tent. I am not feeling alright but will decide either leave for camp I tomorrow or not. Samina,Nungshi,Tashi and Sanju are plannig to touch CI tomorrow. The weather looks good, so they are all getting ready, lets see how things go tomorrow!! Again on the glacier, today samina also got her crampon, i had ordered a new pair of crampon from Khatmandu and Mingma sent it by Helicopter, so samina enjoyed today Jumaring, repelling and top rope climbing. there were several other Sherpas too. The over hang jumaring was great. Later we unpacked and went for Lunch, we felt cool today, as we did some practice, in the night we had some play and lots of chat. I had some chest issue, pain, "Acidity" but not too bad, Samina doing perfect, so are vNungshi & Tashi doing. Day 14-17: Mt.Everest Base camp. Well: during the past days, lots of things happened, most of the time, we had fun and good weather, since in our team we are now six people , we two Pakistanis, Indian twins, "Nungshi and Tash" and two other Indians Satiya and Sanju, a Nepal actor. Arjon. We are now like a family and the friendship is so close, it doesn't look that we met for the first time. Most of the time, Samina and the twins stay in one tent and move around together, so I found things very interesting, looking at the bleek political gesture of both countires, youths are so much creative and bright in accessing things. Looking at the ground reality , the youths of both countries want very much peace and NO to WAR! Having lots of discussion about Pakistan-India Issue, I came up with an Idea!!! Why dont we work together within our capacity for peace building? Therefore I framed a project between Indian and Pakistani Youths "Adventure Diplomacy between Youth" the idea is to climb "Seven Summits" together for peace building and friendship between the youths of Pakistan and India. Looking into the past few decades, we find somehow hate, disrespect and enemety for each other, does it make anything better? Does it create economic prosperity, does it make anything better in both countries? Just revisiting history of World War I & II, what can we see? Does that enemety between those countries has to last long? Does that make any longer impact, or does that contribute to world and its progress? Well, when we know that In Europe, World War I &II had the most destruction between Germans, Italians, French and the rest of nations ,those who fought in the war - is it still the same till today? Or is there unity without any borders now? Don't they have one common currency? Isn't there free mobility? From history we all should know that those wars never had any good outcome and people now need to understand that war is just destruction and NO good outcome? We in Pakistan and India why don't we learn from history of those people? Why don't we go for economic prosperity? Why not for education for all? Why not in science? Why not technology? Why not work for good and do the best for the upcoming generation? Why do we need nuclear bombs when poverty is eating our countries? Why do we need missiles, fighter jets, when illitracy and bad health is eating our nations? The only necessary need for the youth of today is education, good jobs, free mobility and progress in life and to contribute to the betterment of the world. Today we, the youth, we dont need bombs,we need BUTTER!!! So our project theme is to work for peace through adventure and also for gender equality within our capacity and our countries. We hope our project will be supported by those who think we are right in this regard and our co-effort will be helpful? Well: apart from thinking about adventure diplomacy, we meet our friend Suzanne, she kindly donated a down suit for Samina´s expedition. Suzanne is a professional freelance guide, recently working for Himax. Now she will guide a Lhotse expedition. We visited her and had a great time. It looked that the suit is bigger for her, but after we checked it, it was fine and fits her perfectly, though Gineth Soto our kind friend also donate her down suit for her and that fits her PERFECT! So samina will decide wich one she will use. Mt.Everest Base camp to Gorak Shep, Kala Patthar (5.545m) & Back to Mt.Everest Base camp (5.350m). Gorak shep to Mt.Everest Base camp 5350m. The night at Gorak Shep was fun, we had lots of chit chat till late night, Sanju told a lovely story. In the morning we packed everything and then we had breakfast. In the morning we met again the three Pakistanis, made pictures with them, they wished us great luck, Mr.Umar, Dr.Mansoor and one more guy. I checked emails and replied as much as the time allowed me, while Samina and others left for EBC. I was the last one today, left almost one hour late, cought Maria and Martin, later Satiya and Ankur. But couldn’t catch up with Samina, Nugshi and Tashi. When I reached EBC they had already arrived. The base camp is nicely done, the mess tent and our tents are just amazingly placed. Hot juice, tea and coffee was served, Later our tents were shown to us, Samina,Tashi, Nugshi, mine and Sanju tents are in line, near to each other, just a minute from Khumbu glacier. The tents are cozy, nicely furnished from inside, double matteress and pretty open tents. Some of these tents can be used for four people but it is a luxurous service of Seven Summits. They really provide the best service one can imagine! After setting up the tents we went for lunch, which was great again: mixed vegitable, soup, meat, rice and bread. Really awesome, the tables are fixed with different flavours of juice, milk, coffee ,tea bags and much more ;-) What else can you ask for? The service is perfect. And so is the atmosphere here in the camp, just perfect! Dinner was as brilliant as always with a lovely team and a great setup of Seven Summits,our outfitter. We even have a bakery and a tv tent. All seems awesome. Later we talked to the Sherpa climbers. Very lovely people and friendly. Three new friends: Tashi, Samina & Nugshi. Tashi & Nugshi are twins from India attempting Everest, too. Both of them are adorable! We have a great time together! Our hike from Lobuche started at 7:30am, it was a little bit windy last night but everything was perfect,after breakfast we left for Gorak Shep, which is not far from here, almost 3 and half hours hike. The path was full of people, Yaks and porters. Samina is doing perfect. The indian twins and Samina became very nice friends, and enjoy the trek/expedtion. It is a common perception that both countries don't go along well, but i feel that there is nothing between the two countries and especially no differences between the common people. Sonju and me share the same room and we have become great friends. The only regret is that, the politicians create this situation of distrust on national level between our two countries - but between the common people on personal level there is no such difference and distrust. On the ground we are all people and in our team there are five indians and we became great friends. The trek up to Gorak Shep was pretty nice, we arrived at the lodge and got the rooms. Later Samina, Nugshi andTashi went to Kala Pathar and I "Mirza" went to EBC. It was a great trek and took 1:15minutes from Gorak Shep. At EBC ,while trekking up, i met Alex my great Spanish friend, he is going back to Namche with Carlos who feeling litle sick in his throat. Back at our GREAT SEVEN Summit camp, which has been set up just on the foot of famous khambu ice fall, we receive a warm welcome. We are so close to the ice fall, it takes just two minutes to put on the crampon and climb on. The base camp manager of Seven Summit Trek. Mr.Sonam, welcomes me and acompanies me, served juice, hot water and then I ordered my lunch. After lunch I run down to meet the cubic group, led by Lucy. We went to Russal Brice camp to look for Suzanne, but she has not arrived yet. I got back to Gorak Shep in 40 minutes, the dinner was fun, interestingly during our dinner I met two Pakistanis, Mr.Umar, Dr.Mansoor Ul Haq. It was amazing to meet two Pakistanis. The night was full of fun, Nughsi,Samina,Tashi and Sanju we had lots of fun and talked into the night until 11:30am. Tomorrow we reach EBC, where we will stay for nearly two months! In our group, Maria from Portugal runs a foundation, which works in Bangladsh for unprivileged kids, working for nearly 500 kids to be educated. Maria`s Mt.Everest Expedition is to help these kids. Maria is currently based in Abu Dabi. The trek looked pretty cool, Mirza speeded up and it took just two hours from Pheriche to Lobuche. While trekking up, we met a sick porter and that is just because these porters are treated inhuman, like ”pack animals” these poor porters carry more than 70kg, and I was told that these porters are paid only 10$ per day, this is very brutal, compared to portering in Pakistan, where they are treated very nice. The carrying weight is restricted to only 25kg and they are paid per stage, not per day! This makes me feel good that at least portering is better in Pakistan. Reaching Lobuche we found nice lodges, but all with same colors. We had to look for our hotel, finally at “Mother Eearth Hotel” the guy said, Seven Summit has booked with us, and gave me the key, plus served hot juice. The lodge was the best in the hole trek so far, after one hour and half, Karmi sherpa, one of our guides arrived and told me that we booked another lodge, so I moved with my pack there and saw Samina, the Indain twins and other team members had also arrived. For some members it took 5 hours! Samina is feeling super good and so do the Indian twins. It is interesting to tell our readers, that there is a total of five Indians in our group and two males along the twins will attempt Mt.Everest. Despite Pakistan being home of incredible mountains, sadly no such activities have been seen nor supported yet, it hurts me. My country has so beautiful mountains and great potential but yet people have not encouraged, supported this sport, while the rest of the world produces athetles in every sport, particularly mountaineerng. The government must take bold steps to promote tourism, since it is a huge source of forex. For lunch we had a great and delicious meal, enjoyed the lunch and the time for some rest. Dinner is coming soon. Well, in our team there are fourteen people. Two Pakistanis, five Indians, two Portugies,one Bulgarian,one Russian, one Argentinian and two more people are to come. Time to say good bye to all of you, if you like share the page .. The trek was supposed to be easy today as we had only four hours trek to Pheriche. In the morning at 7am we gathered in the dining hall and after breakfast our guide told us that today we would go for Puja before leaving for Pheriche. A Puja is a ritual of Buddhist people, every expedition has to meet the Lama who holds the Puja. The Lama gives prayers and blessing scarfs and also a card with prayers written on it. we went to the Monastery first, after that we went to the main Lama house, where we found several other expedition members, the Puja took nearly one hour and a half, after that the trek started. The path was pretty open and yaks and humans were chasing each other to get to their night stay place. We had our lunch on the way to Pheriche, then another one hour to Pheriche, which is an amazing place, so beautiful. Still the ice is metling and pretty cold. We reached our booked lodge and warm tea was served. Pheriche, is 4200m above sea level. The landscape is just incredible! A good view of Lobuche peak is awesome. The entire team arrived around 4pm and the dinner was served. We enjoyed the good foodvery much: Yak steam,boiled vegetables, cheese burger, cheese pizza all just too good. The rooms are also good, tomorrow the trek will lead us up to Lobuche. The trek started in the morning at 8am, after a nice breakfast, the lodge owner gave us good luck scarfs and greet ed us and said good bye. We left in good mood. Hundreds of people were hiking up through the trails, its interesting to see hundreds of people visiting this part of the world. And it is sad that Pakistan, Gilgit-Baltistan, K2 and Concordia, Hunza, Shimshal Pass, and Chitral provides great adventure treks and climbs, but unfortunately very few tourists go there. People around the world need to know that those areas are pristine and woth visiting as well, with all the natural beauty of Pakistan!! Well, after one and half hour of hike, we reached our lunch place, the lunch took longer than normal , however we continued for the destination. Weather is nice, warm and we trekked in t-shirts. 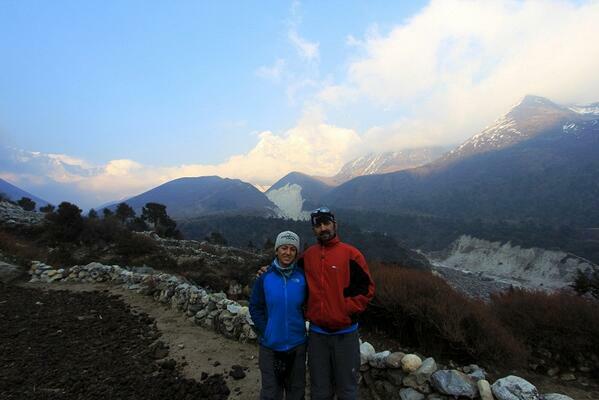 The weather was nice,after break fast , we start our trek from phakdin toward Namche. Every one in the group was feeling great, today was supposed to be long day and uphill climbs,including passing through several bridges, after two hours of trek, we stopped for check point for entery, it was done and we continued, at lunch place we spend nearly two hours, the food was surved and we start for Namche, from here Mirza start fast and got to Namche one hour before the rest of the group. I did takek some shoots too, met the jordanians ,Mostefa who leading them, felt so good to see this much large Jordanian treking to EBC. When I reached Namche, didn’t know which hotel we going to stay, then called Mingma in Khatmandu he told me to go to Himalayan lodge, the guys there so nice and served with hot tea, later the team arrived iNcluding samina, Samina ,Tashi and Nugshi became good friends and enjoying the trek ,lots of laugh and fun.before Dinner, I hiked up to the airport above Namche Bazar. The view is just incredible. The lodges are nicely built and amazing colors. Nice Market. Within half hour I turned back to Hotel. Dinner was nice, and lots of fun. It was pretty early at 3 am when we woke up and rushed for the airport, just to hear the announcement, that revealed that the flight is one hour delayed, we kept waiting at Quid E Azam airport Karachi, til 8am,when the announcent was made to porceed, the flight was nice. While boarding the plane, we met a nice lady from Finland and had nice conversations during our flight. PIA flights are usually interesting . We finally arrived in Khatmandu. Since we had visa in advance, there was no problem to stand in line. Outside Dawa and his staff were waiting for us, a warm welcome was made and the traditional scarfs were given to both of us, then we were brought to the hotel. It is pretty hot in Khatmandu! One interesting thing I found was, that the roads were broken and work was still underway. When I visited Khatmandu for the Manaslu Expedition last year, it was the same ;-) At the hotel we arrived around 1:30pm, after check in, Dawa told us there is Dinner for the entir group at 7pm, so we had some time and since we were sleepless for the last two days already, we took a nep first. After that we went to the nearest shop to purchase necessary things. And in the evening at 7am Tashi came to pick us up and drove us to the dinner place. Another good thing at our hotel is free wifi that we can use. When we came back from the dinner, we enjoyed some great Nepali traditional dance. I loved it thoroughly, we met Mingma the elder brother of Dawa, the first Nepali sherpa to complete all 14x8000er mountains in the world. We also met their other brothers, very lovely people and nice dinner and dance. The next highlight of the days was meeting our Indian team members, there are two twin sisters from India, going to climb Mt.Everst. Later we went to hotel at around 10pm. we rushed to the airport to catch the flight for Karachi, since there is no direct flight to Khatmandu. We managed to fly to Karachi after half hour delay. Arrival time in Karachi was around 11pm. Pakistan International Airlines (PIA) took us to their Hotel, the flight was nice except the delay. We had exess weight but thanks to PIA to let us go through with out extra payment. Very nice support from PIA!